Is Laglag Bala Distracting Pinoys from Bigger Issues? You've all probably heard about the "laglag bala" incidents in NAIA. I have been traveling a lot these past few years in and out of the country with my family and never had a problem with "laglag bala" scam. Have we just been lucky? How long has this scam been going on? It seems like each week, there are new victims. Airport workers are allegedly been planting bullets in unsuspecting traveler's luggage and extorting ridiculous amount of money from them in order to avoid jail time. Most victims just give in and pay them bribe money to avoid serious hassle. If I were them, I would secretly record my conversation with the airport personnel, never touch the bullet, and demand for it to be fingerprinted. And yes, call my lawyer, get the names of those people asking for money, maybe even take a photo of them, and call a journalist friend to feature them in the newspaper. These crooks should be publicly shamed! Don't pay them the bribe money and don't let them intimidate you coz if you do, you are just enabling them to victimize more people. But considering the amount of bail for illegal possession of ammunition (Php 150,000), I guess most victims would rather just pay them the bribe money they are demanding which is $500-$1,000 (depends on your haggling skills) instead of dealing with all the hassle like missed flights, non-refundable hotel charges and tour packages, lawyer's fee, bail money, and etc. Some have been saying that this "laglag bala" scam is just being used to distract Pinoys from more important issues like the massacre of the Lumads in Mindanao, PDAF, INC scandal, and etc. But what about the "luggage wrapping" companies at the airport? Lol. They are the ones who benefit from this issue the most. Heck, maybe I should franchise one too! But it does make me think, with all the media coverage that the airport is getting right now, why haven't they stopped? It seems like the more media coverage they get, the more people become victims of this scam. I feel for the Lumads who were not getting the media attention they deserve considering the seriousness of their problem right now. So what's the solution? I don't know...maybe fly through Clark airport instead? If only they have more international flights like NAIA! I think the best thing to do right now is avoid bringing luggage with outside pockets or if you do, make sure to wrap it up good before going to the airport and never let it out of your sight. 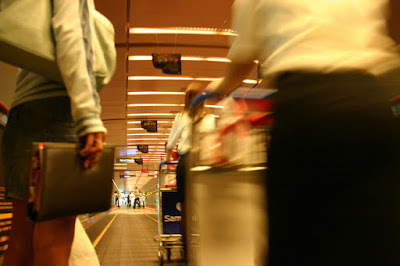 Are you a victim of laglag bala scam at NAIA? Share your experience in the comments section!